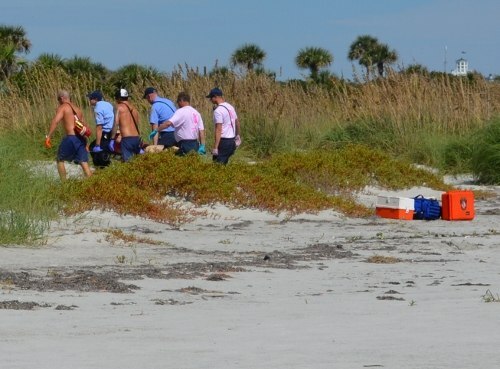 CAPE CANAVERAL, Florida -- A 35-year-old woman was bitten on the leg by a shark in Cape Canaveral, Florida according to dispatchers just before noon today at the beach located in front of Beach Park Lane in the Villages of Seaport just south of Jetty Park and Port Canaveral, Florida. Brevard County Fire Rescue, Cocoa Beach Fire Crews, and Brevard County Lifeguards responded to the scene. The woman was transported to Cape Canaveral Hospital in Cocoa Beach, Florida. UPDATE: Brevard County Fire Rescue spokesperson Lt. Jeffrey Taylor said that the woman is listed in stable condition. According to the International Shark Attack File maintained by the Florida Museum of Natural History, Brevard County has had 101 attacks from 1882 to 2010. Only one of the attacks were fatal, which occurred in 1934.